I'm overdue for a blog post due to job searching, DIY and spending time on graphics for my Nintendo DS game, The Fruit Machine - Vampire Castle. 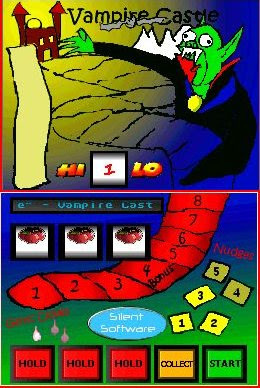 The graphics (vampire and all) were drawn by hand on paper, scanned and GIMPed, reels were shaded and rendered using my own utility program (apologies for the quality of screenshot - the jpegs were compressed with MS Snipping Tool). As you might expect, I'm not a graphics designer so this has been the longest part (particularly lighting up the sprites, i.e. on and off states). The bottom screen is complete (yes the trail is meant to look a little amateurish, a "cartoony" look against the realism of the buttons and reels), I'm still working on the top. As for sound, well I spent a good £5 sampling random fruit machines at a local arcade, so my own hard earned money went into this, all in the name of research of course. The code is only ~10% complete just enough to load sprites and play some rudimentary button, reel and collect sounds, this allows me to test the graphics and noises. Basically it's a sound board. The good news is I don't think the program and logic will take long to code and I have a basic idea of the code design structure. There's also going to be a (nice) surprise for anyone who wins the jackpot prize. As for the source code, well I haven't yet decided whether to make it open source, but it will probably be GPL 2.